LeBron James' first year with the Los Angeles Lakers will dominate the NBA agenda in the 2018-19 season. The 33-year-old superstar left the Cleveland Cavaliers to start a new chapter of his storied career with the Lakers, who also added Lance Stephenson, JaVale McGee, Rajon Rondo and Michael Beasley to their roster. But there are multiple other narratives outside of Los Angeles that are worth keeping up with. 1. How will the Rockets fit together? Houston finished last season one win short of the NBA Finals. But the Rockets went through a major roster overhaul in the offseason as they lost forwards Trevor Ariza and Luc Mbah a Moute in free agency. Houston also traded Ryan Anderson to the Phoenix Suns for Marquese Chriss and Brandon Knight. Houston's biggest addition, however, was bringing in 10-time All-Star Carmelo Anthony. How will all the new pieces fit together? We'll find out. 2. Are the Celtics the real deal? Gordon Hayward and Kyrie Irving will return healthy this season, giving Boston one of the deepest rotations in the NBA. On paper, this makes the Celtics the best team in the East and a real threat to unseat the Golden State Warriors as NBA champions. While the Eastern Conference is wide open, Boston will still have to navigate past the reloaded Toronto Raptors and the young Philadelphia 76ers to earn top spot. 3. How much will the Raptors improve? Toronto added more star power and a new coach to a team that won 59 games a season ago. The Raptors fired coach Dwane Casey and replaced him with former assistant Nick Nurse. 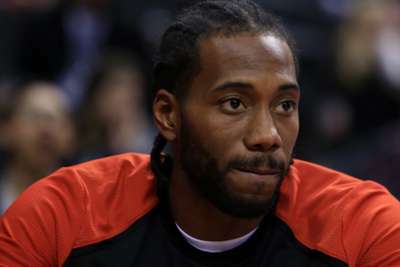 They then acquired disgruntled star Kawhi Leonard - as well as Danny Green - from the San Antonio Spurs for a package centered around DeMar DeRozan. Leonard and point guard Kyle Lowry should be one of the top scoring duos in the league. But how much will the Raptors' offseason moves affect their results? Toronto has tallied 48 or more wins and reached the playoffs in five straight seasons, yet the franchise is still looking for its first NBA Finals appearance. 4. Which rookies will make an impact? The 2018 rookie class is loaded with talent. Top pick Deandre Ayton, Mavericks guard Luka Doncic and Kings forward Marvin Bagley III could become key pieces for their teams. Multiple other players have the potential to become All-Stars for years to come, too. Some first-year players will undoubtedly struggle while others have a chance to elevate their teams into playoff contention. It will be interesting to see who ends up as a star and who turns into a bust. 5. Will the Nuggets make it back to the playoffs? The Denver Nuggets missed the playoffs by one game last season. Denver went 46-36 in 2018-19 and finished just behind the Minnesota Timberwolves for the eighth seed in a stacked Western Conference. The Nuggets are without a postseason appearance since 2012-13. However, they will have a chance to change that this year behind developing star Nikola Jokic and a fully healthy Paul Millsap.